Some trading names vanish and others emerge during recessions and Manchester’s property market is getting used to seeing Vision Developments on the buyers’ side of the table. In April, in partnership with Les Lang’s Infinity (see feature, p65), the company completed the £6m purchase and leaseback of 53 King Street. The building, which had been owned by Lloyds bank for more than a century, is one of the most architecturally notable in central Manchester. Vision has been capitalising on the weak market to gather an investment and development portfolio in prime city centre sites. Although the charismatic Morgan Leahy, who made his money in Limerick’s haulage industry, is well known on the Manchester property circuit, the public face of the business is Cliff’s. ‘We’re looking at investment opportunities with two or three years’ income and with redevelopment angles in the future,’ he says, standing in the grade II-listed Barton Arcade in Deansgate that Leahy bought in 2007. It was in 2005 that Cliff first worked with Morgan Leahy, who had just bought the Bauhaus office, hotel and residential block in Quay Street from Ask for around £15m. In 2007, Leahy sold Bauhaus for a £7m profit to Blackrock, formerly Merrill Lynch Investment Managers. In the same year, Morgan Leahy paid £17m for Barton Arcade and £12.7m for the adjacent Lancaster Buildings, both comprising shops below offices, and both now part of the Vision portfolio. Leahy also agreed a £2m sale of the Lancaster Buildings’ office element to Maple Grove. Vision’s first acquisition, last September, was Invicta House, an office building on the edge of Allied London’s Spinningfields business district. It was bought from Maple Grove for £3.5m. The 53 King Street purchase was made with another former Ask director, Les Lang, who now runs the Infinity fund. They bought the 43,000 sq ft investment at a 12% yield. The transaction was financed with bank funding from an unnamed source and £2.5m of equity. Cliff says he expects another three deals to complete before the end of 2009, although he is not yet prepared to divulge details. Leahy, who divides his time between Limerick and Manchester, retains business interests in Ireland and is said to raise additional finance to form consortia on some deals. Invicta has several tenants with two to three years left to run on leases, leaving Cliff to concentrate on Lancaster Buildings and Barton Square. Barton Arcade has 30,000 sq ft of offices above the fully let retail space, as well as small suites, which are being refurbished. The biggest change will come, subject to planning consent, along the street behind Barton Square, where Cliff plans to create glass frontages and entrances to open it up to retail activity on both sides. For years, the street has been a ‘rat run’ cluttered with wheelie bins and bars. Its main public use is as a means to access the Circle Club, a nightclub in the basement. 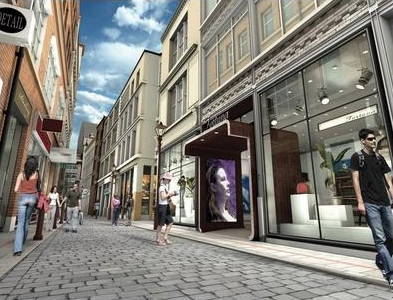 Cliff says the street, bordered on one side by the back of St Anne’s Arcade, could be opened up and effectively made anew. A planning application is expected by the end of the year, although a start has already been made. Earlier this year, the Circle Club opened restaurant kitchen on the ground floor of Barton Arcade. Cliff says it received funds for the fit-out and a generous rent-free period. Cliff is consulting retail tenants about later opening times. Meanwhile, retail usage has been extended to the first floor. The market will be watching closely to see where Cliff and Morgan Leahy buy next. Purchases such as the ones made so far should establish the Vision name before too long. This entry was posted in In The Media. Bookmark the permalink.